Now that Lent is back, Jared and I are once again doing the Daniel Plan. This diet is inspired by Biblical principles that focus on the essentials of Faith, Food, Fitness, Focus and Friends . It is really not a bad lifestyle plan for anyone to adapt, and I hope to eventually make it a way of life versus just a “seasonal” diet for us..because it is just that, a lifestyle. Like most lifestyle plans, saturated fats, processed carbs, and sugars are off limits with the Daniel Plan. Wholesome foods like sprouted grains, low glycemic fruits, and organic or lean meats are key. We have been enjoying more fruit like cantaloupe, berries, and substituting conventional carbs out for their whole grain counterparts. Overall, it has been a pretty smooth transition for us. One thing that I was a little sad about was the fact that I couldn’t enjoy mayonnaise. When you love things like egg or tuna salad, this kind of becomes an issue..or does it? After some brainstorming, I came up with a delicious recipe for amazing avocado tuna salad that is Daniel Plan inspired! It is tasty, jam-packed with flavor and provides a hearty does of heart-healthy omega 3’s! 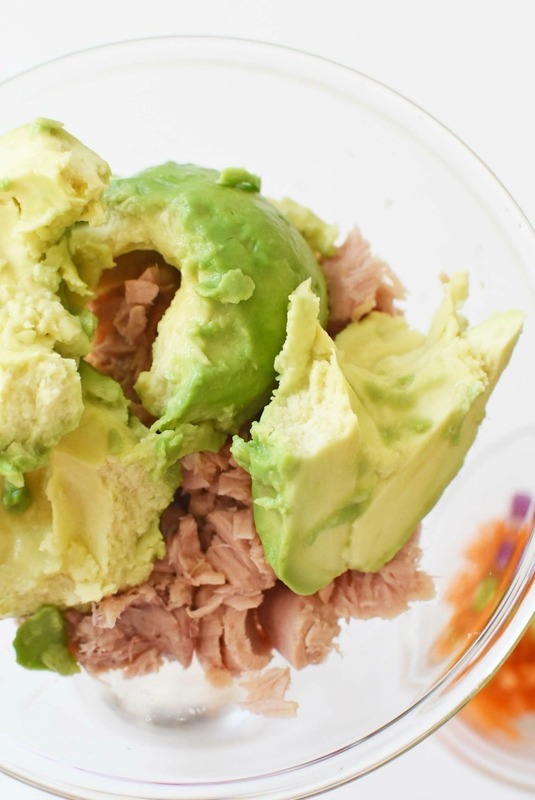 To make this Daniel Plan inspired, no mayo tuna salad, I used a medium-sized avocado! Simply peel, core, and puree and avocado and use that in lieu of mayonnaise. 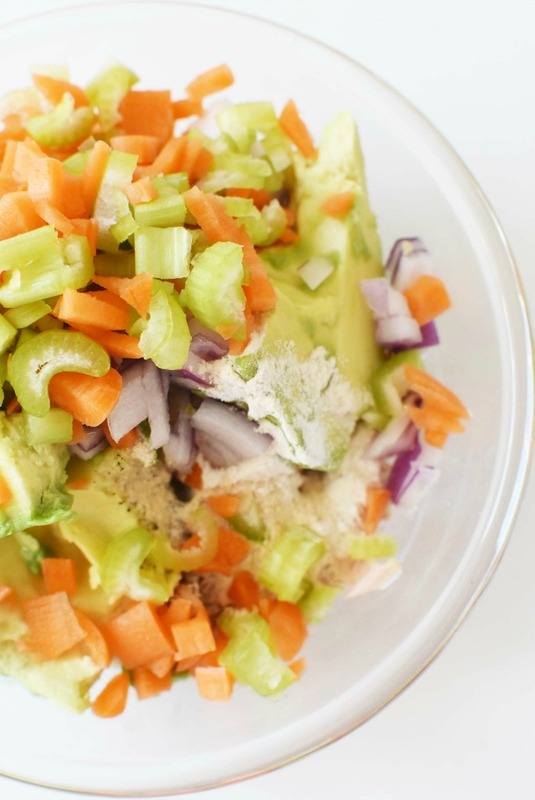 Avocado tuna salad tastes delicious, and honestly almost like mayo! I love to enjoy my no mayo tuna salad chunky-style and on a bed of greens. 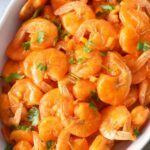 Even if you are not on The Daniel Plan, and just want to eat more wholesome, this recipe is for you! 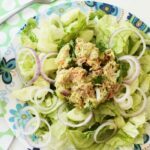 Get the printable version of this Amazing Avocado Tuna Salad (Daniel Plan) by clicking print below! Or, you can find this mayonnaise free tuna salad recipe right below! 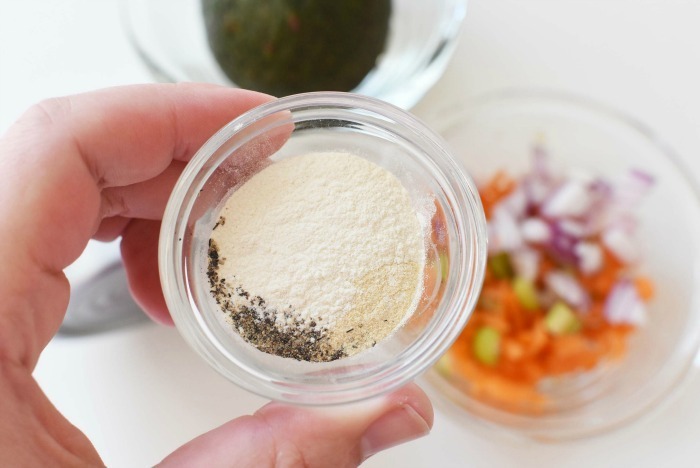 Simply add all these ingredient to a bowl, and combine until fully mixed. 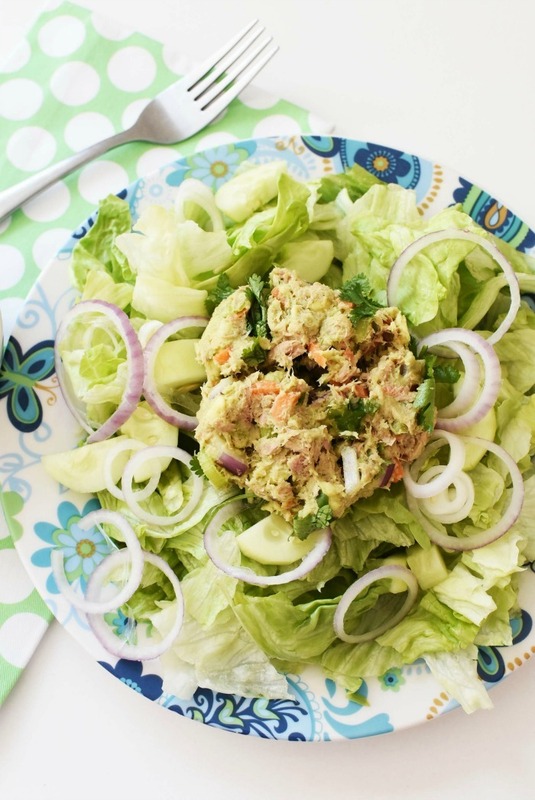 Enjoy this avocado tuna salad on a bed of greens, or alone! 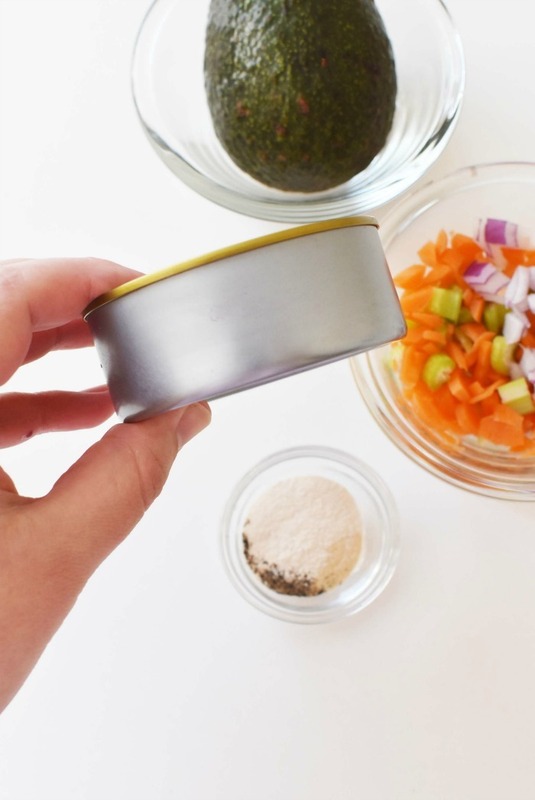 Want another fun recipe using tuna fish? How about these Zucchini Tuna Nachos? Get the Daniel Plan book on Amazon! 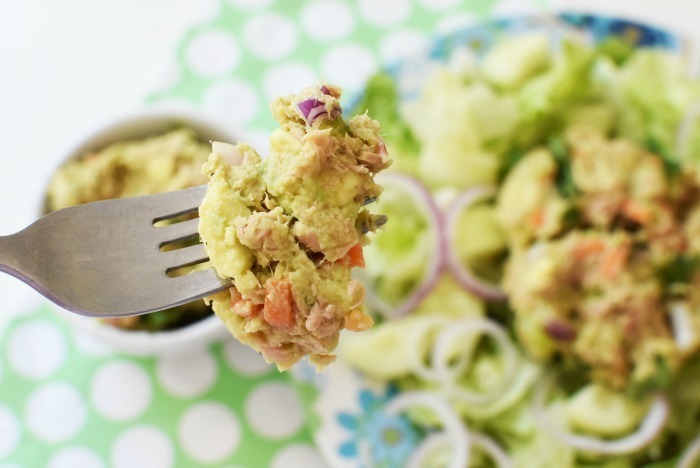 A creamy, and flavor-packed tuna salad recipe that is low carb and uses no mayonnaise. 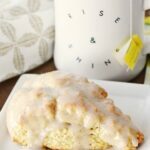 This is a Daniel Plan inspired recipe. Add all the ingredients to a bowl, and combine! Enjoy over a bed of greens or alone. That looks simply delicious! I’m always trying to find ways to eat healthier but also bring in taste. This will be delicious I’m sure. I’m not a huge fan of mayo. What a great alternative! I’ve never even thought to use avocado. I bet it tastes amazing! Using avocado in place of mayo was genius! 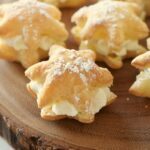 It has the creaminess of mayo, a great flavor, and a ton of healthy fats. Love it! This sounds so healthy and refreshing! I’ve been looking for a new way to spruce up my salads that I get bored with so quickly and love avocados! We love avocado nut have never had it in tuna but it does look and sound good. I will try and share this with people who want a healthy tuna alternative. Oh my this sounds AMAZING! I love both tuna and avocado! 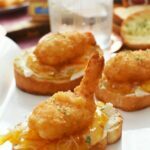 I’m going to have to make this for lunch this week. 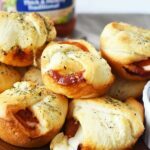 This looks like a great lunch idea! Will definitely try this soon!